Discussion of the effect of electrical simulation on the diaphragm dates back over 200 years. In 1872, Duchenne1 concluded that phrenic nerve stimulation was the “best means of imitating natural respiration.” Christoph Hufeland2 first proposed artificial respiration through electrical stimulation of the phrenic nerve to treat asphyxia in 1873. Despite its documented experimental successes, phrenic nerve stimulation faded to the background as positive pressure ventilation by mechanical ventilation became readily available. In the late 1940’s, S.J. Sarnoff and colleagues at the Harvard School of Public Health showed that, in the absence of spontaneous respiratory activity, rhythmic stimulation of the phrenic nerve could duplicate minute volume, arterial blood oxygen and carbon dioxide tensions. This was reported in the October 1948 issue of Science3, in which Sarnoff documented 52 hours of phrenic nerve stimulation as the only means of artificial respiration in a 5 year-old boy with respiratory paralysis following a cerebral aneurysm. 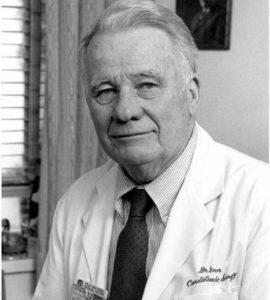 Based on his pioneering research in cardiac pacemakers, William W.L. Glenn and his colleagues at the Yale University School of Medicine set out to create the first practical application of phrenic nerve pacing. Although first mentioned in 19664, the seminal work on the topic was an article titled “Radio-frequency electrophrenic respiration. Long-term application to a patient with primary hypoventilation” which appeared in the March 1968 issue of the Journal of the American Medical Association5. In collaboration with Roger E. Avery, Glenn’s prototypes were brought into commercial distribution by Avery Laboratories, Inc. in 1971. The Medical Device Amendment of 1976 mandated the classification and regulation of medical devices and in 1986, under FDA regulations the Medical Device Amendments were enacted into law. In January, 1987 Avery became one of the first to obtain PMA approval under this regulation. Furthermore, in 1995 Avery breathing pacemaker system was one of the first products to obtain premarket approval as a Class III device under the requirements of the Active Implantable Medical Device Directive (90/385/EEC) for distribution within the European Union. Since the commercial introduction of diaphragm pacing systems, there have been substantial advancements in the state of the art surgical techniques. Concurrently, the introduction of cervical and thoracoscopic minimally invasive approaches advanced the implantation of diaphragm pacemakers. In 2002, Donald Shaul and colleagues6 at the Children’s Hospital of Los Angeles reported on the first series of pediatric patients, starting in 1997, that were implanted with diaphragm pacing systems using a thoracoscopic technique. In July 2015, Dr. Dilys Gore, Tony Martins and Linda Towler, three long-time employees of Avery Biomedical Devices (ABD), purchased majority ownership of ABD from the Estate of Claire Dobelle. Newly focused, yet with the benefit of wisdom, we will always hold the highest quality standard for the Company to ensure the Avery Diaphragm Pacing System improves the quality of life of those we serve. This is our personal commitment to you. Our vision for the future is to expand our research & development department enabling us to collaborate with our clinicians, universities and of course, our users to develop innovative medical devices and technologies. We hope you will be pleased with our commitment to you. Please feel free to call, e-mail or write with any comments, questions or suggestions. We always look forward to hearing from you. 1Duchenne GBA. “De l’electrisation localisée et de son application a la pathologie et a le thérapeutique par courants induits et par courants galvaniques interrompus et continues per le dr. Duchenne.” Paris, Baillière,1872. 2Hufeland CW. “Usum uis electriciae in asphyxia experimentis illustratum.” Göttingen, Germany: Dissertatio Inauguralis Medica; 1783. 3Sarnoff SJ, Hardenbergh E, Whittenberger JL. “Electrophrenic Respiration.” Science. October 29, 1948. Vol. 108, p. 482. 4Glenn WW, Anagnostopoulos CE. “Electronic pacemakers of the heart, gastrointestinal tract, phrenic nerve, bladder, and carotid sinus: current status.” Surgery, 1996 Aug; 60 (2): 480-94. 5Glenn WW, Judson JP. “Radio-frequency electrophrenic respiration. Long-term application to a patient with primary hypoventilation.” Journal of the American Medical Association. March 1968, 203(12), pp. 1033-1037. 6Shaul DB, Danielson PD, McComb JG, Keens TG. “Thoracoscopic Placement of Phrenic Nerve Electrodes for Diaphragm Pacing in Children.” Journal of Pediatric Surgery. July 2002, Vol.37, No.7, pp.974-978. 7Elefteriades JA, Quin JA, Hogan JF, Holcomb WG, Letsou GV, Chlosta WF, Glenn WW. “Long Term Follow-up of Pacing of the Conditioned Diaphragm in Quadriplegia.” Journal of Pacing and Clinical Electrophysiology. June 2002, Vol.25, No.6, pp.897-906.